June 1991: first stage appearance (omemie), at the Kabukiza where he plays the role of Tsurunosuke in the drama "Ninjô Ura Nagaya". June 1994: debut on stage (hatsubutai) at the Kabukiza, where the 32nd anniversary (33rd memorial service) of the passing away of Nakamura Tokizô IV is celebrated; he receives the name of Nakamura Baishi IV, playing the roles of Chôbê's son Chômatsu and a young traveller in the play "Yudono no Chôbê" and the dance "Michiyuki Tabiji no Yomeiri"; the role of Chôbê is played by Yorozuya Kinnosuke. October 1996: Baishi plays at the Kabukiza the role of Tsuruchiyo in the drama "Meiboku Sendai Hagi"; the roles of Masaoka, Yashio and Masaoka's son Senmatsu are played by Nakamura Jakuemon IV, Kataoka Takao and Nakamura Mantarô. February 2000: special kodomo shibai dance program to end the evening program at the Kabukiza; Baishi plays the role of Maizuru in the dance "Kusazuribiki"; the role of Maizuru is played by his brother Nakamura Mantarô. January 2008: revival at the National Theatre of Sakurada Jisuke I's kaomise drama "Komachi-mura Shibai no Shôgatsu"; Baishi plays the role of Princess Katori [more details]. September 2009: short Kabuki tour in Monaco for the Naritaya guild; Baishi plays the role of a butterfly spirit in the dance-drama "Kagami Jishi" [more details]. 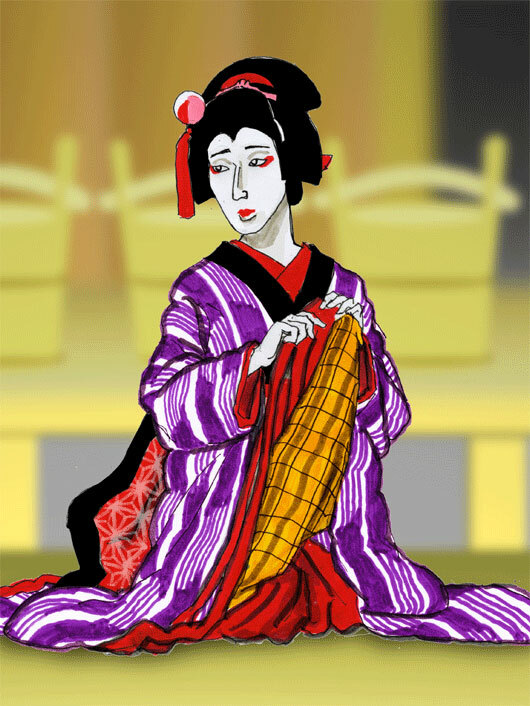 January 2014: premiere at the National Theatre of "Sanzen Ryô Haru no Komahiki", a revival of Tatsuoka Mansaku's 1794 drama "Keisei Haru no Tori"; Baishi plays the role of Tôemon's daughter Otoyo [more details]. May 2018: 16th edition of the Cocoon Kabuki [more details]. Nakamura Baishi IV is a promising young onnagata actor of the Yorozuya guild.